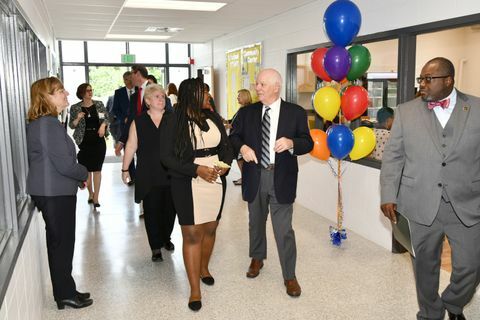 BALTIMORE – June 7, 2018 – The Northrop Grumman Foundation and partners UMBC - the University of Maryland, Baltimore County; Baltimore City Public Schools (BCPSS); Baltimore City Recreation & Parks and several other donors hosted the grand opening ceremony for the Lakeland Community & STEAM Center last week. 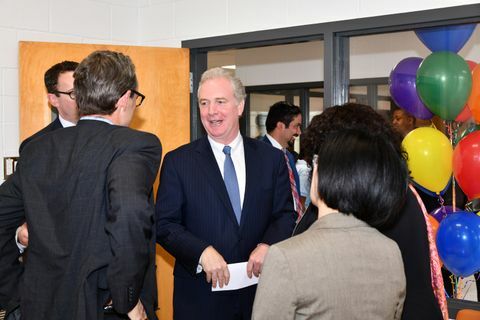 The facility’s state-of-the-art classrooms and easily accessible community resources will better prepare students and families for success in the future. 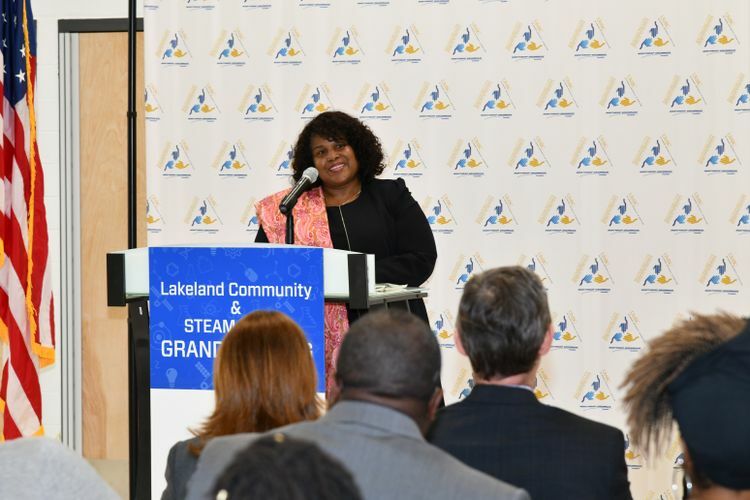 The Lakeland Community & STEAM Center will offer community resources and STEAM education opportunities for Lakeland Elementary/Middle School students and the surrounding neighborhoods. 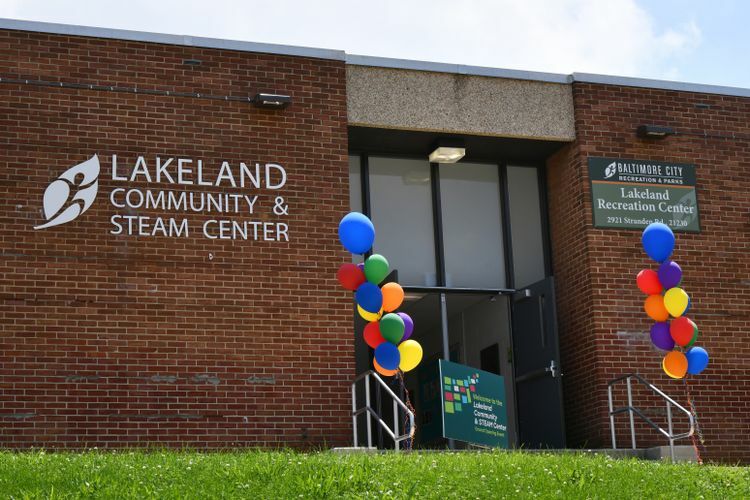 The newly renovated center will host several key programs focused on STEAM education and community services staffed by City Recreation and Parks, Northrop Grumman volunteers, UMBC staff and students, and in partnership with Lakeland Elementary/Middle School. 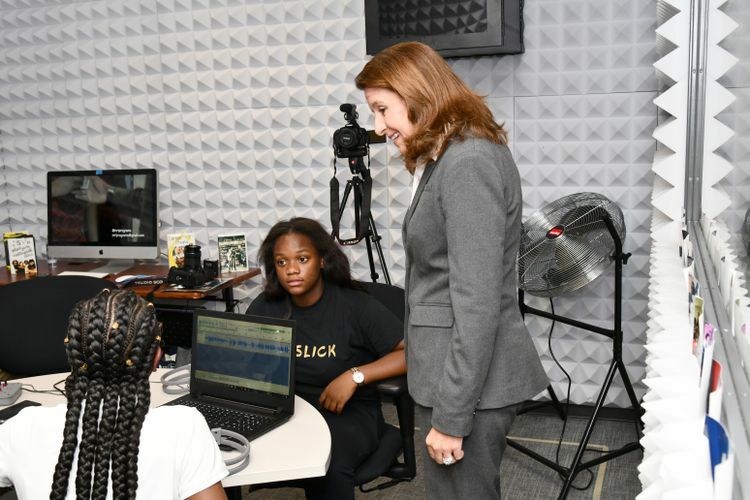 Activities in the center will include hands-on programs featuring robotics, app development, media production, family STEAM night, fitness classes and workforce development programs. Kathy Warden, president and chief operating officer, Northrop Grumman, asks two Lakeland Elementary/Middle School students about media production in a new recording studio added to the Lakeland Community & STEAM Center during its recent renovation. 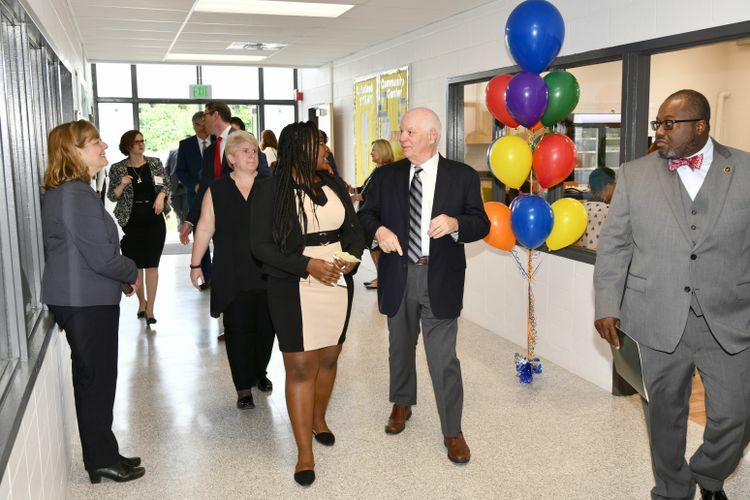 Senator Ben Cardin (center right) greets Lakeland Elementary/Middle student Marigold Lewi (center left) and tours the Lakeland Community & STEAM Center with Reginald Moore (far right), director, Baltimore City Recreation & Parks. 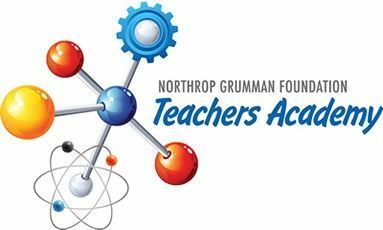 The Northrop Grumman Foundation has donated $1,647,000 over three years to support partnerships in Baltimore city schools, including the renovation of the Lakeland Recreation Center to create the Lakeland Community & STEAM Center, as well as aiding the programming and staff. Northrop Grumman also supports the UMBC Choice Program that helps at-risk students further their education for both Ben Franklin High School at Masonville Cove and Excel Academy at Francis M. Wood High School. "The Lakeland Community & STEAM Center is a prime example of what great community partnerships can create. This Center will be an invaluable resource to students and their parents. Not only will it bring our community closer together, but it will also prepare our students for the exciting opportunities that STEAM education offers. I want to thank everyone involved in this team effort - I'm excited to see what great things come out of this program. " Senator Chris Van Hollen (center) converses with Northrop Grumman executives and employees during the grand opening of the Lakeland Community & STEAM Center. 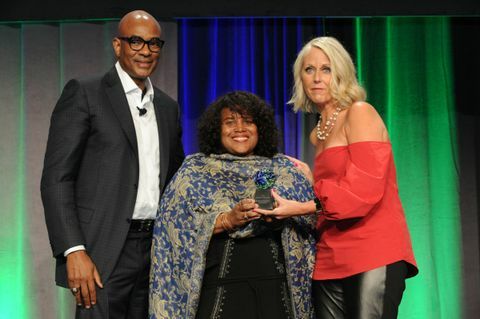 Northrop Grumman and the Northrop Grumman Foundation are committed to expanding and enhancing the pipeline of diverse, talented students globally. The organizations provide funding to sustainable programs that span from preschool to high school and through collegiate levels, with a major emphasis on middle school students and teachers. 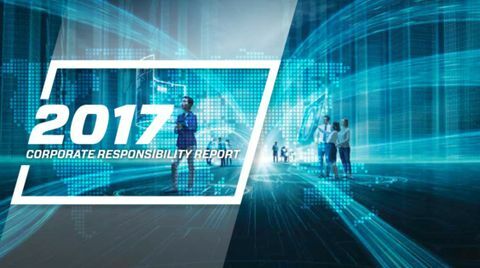 In 2017, Northrop Grumman and the Northrop Grumman Foundation continued outreach efforts by contributing over $20.4 million to STEM-related groups such as the Air Force Association (CyberPatriot), the REC Foundation (VEX Robotics), National Science Teachers Association, Great Minds in Stem (Viva Technology) and EarthEcho’s international Earth Echo Expeditions. 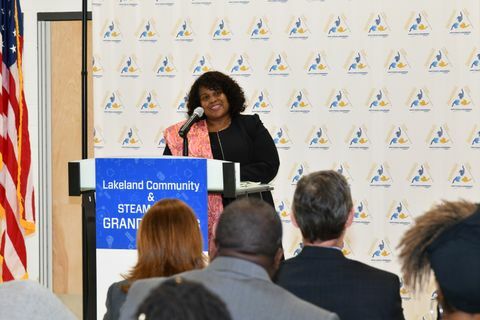 Sandra Evers-Manly, vice president, global corporate responsibility, Northrop Grumman, and president, Northrop Grumman Foundation addresses students, volunteers, and dignitaries in attendance at the grand opening of the Lakeland Community & STEAM Center.